THIS CHAPTER SETS OUT THE NRT’S PROPOSED APPROACH FOR MOVING AHEAD ON ADOPTING LIFE CYCLE APPROACHES TO SUSTAINABLE DEVELOPMENT IN A COMPREHENSIVE AND CONSISTENT WAY. WE BELIEVE THERE IS A CLEAR ECONOMIC IMPERATIVE FOR DOING SO QUICKLY TO ADDRESS GROWING MARKET-ACCESS ISSUES FOR CANADIAN GOODS AND COMMODITIES. EQUALLY, WE BELIEVE THAT THE GROWING DEMAND FOR INTEGRATING ENVIRONMENTAL AND ECONOMIC CONSIDERATIONS IN BUSINESS DECISIONS AND GOVERNMENT POLICIES REQUIRES A STRONGER UNDERSTANDING AND APPLICATION OF LIFE CYCLE APPROACHES IN BOTH THE PRIVATE AND PUBLIC SECTORS. OUR RECOMMENDATIONS ADDRESS BOTH OF THESE CONCERNS. WE ALSO OFFER A PRACTICAL AND STAGED WAY TO IMPLEMENT THESE RECOMMENDATIONS. Life Cycle Approaches to sustainable development are here to stay. While their full application remains a “work in progress”, the trend is clear. From an earlier position of leadership in this area, Canada has not invested as much as needed to keep pace with our trading partners. Knowledge and expertise is growing in this field and Canada must grow with it. The NRT believes that greater involvement in learning and applying Life Cycle Approaches will help the government lead on environmental stewardship issues and better protect our national economic interests in the international arena. Most immediately, action is required from the federal government to better understand and address potential threats to international trade and market access for Canadian commodities and products. As we engage on this and other life cycle fronts, Canadian businesses and governments have the potential to realize cost savings and environmental gains on behalf of Canadians. This is not just a government priority. Business has a critical role to play too. The recommended actions in this chapter will require public-private partnerships and collaboration. Changes in government practices will also be needed over the longer-term. Government actions should be directed first towards supporting the private sector and improving internal government operations and decision making through the use of Life Cycle Approaches. The government’s response needs to be focused on key life cycle issues identified here and staged over time. Short-term responses are necessary to counter more immediate risks to international competitiveness in the areas of trade and market access. Longer-term responses will foster enhanced economic efficiencies and related environmental benefits of Life Cycle Approaches by gradually increasing their adoption in the public and private sectors. In government, these new innovative practices will lead to improved efficiencies in internal operations and the integration of Life Cycle Approaches in policy decision-making. In business, it will result in increased efficiencies in internal operations and throughout the supply chain. As a first step, the government should work with the private sector to identify the current non-tariff trade barriers where Life Cycle Approaches could help address the situation. It should also initiate government-wide discussions to identify areas where costs savings and environmental gains could be achieved within the public service. 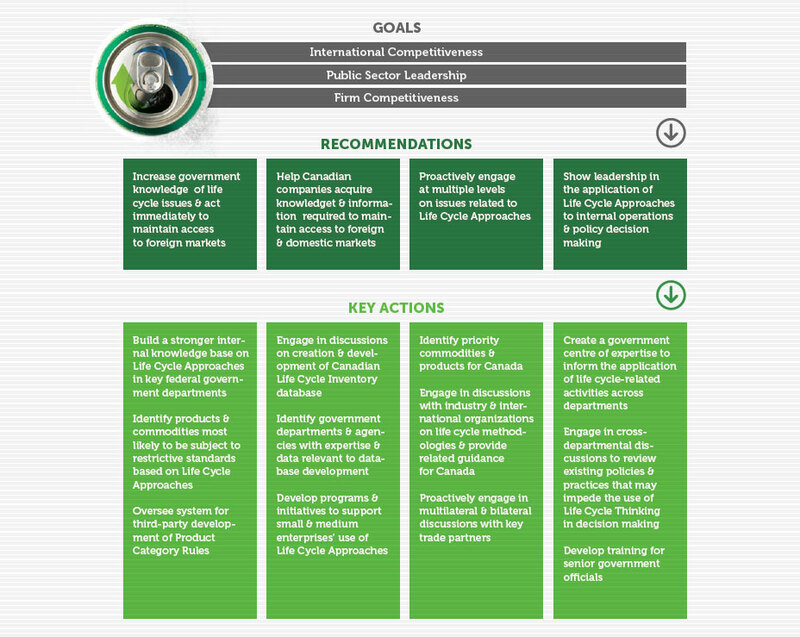 Having established our principal goals of international competitiveness, public sector leadership, and firm competitiveness, the NRT recommends that the GoC move in four areas to respond to the identified risks and opportunities Canada is facing as related to Life Cycle Approaches. From each of these areas, a series of specific recommended actions follow. They are set out in Figure 7. THE GOC NEEDS TO INCREASE ITS KNOWLEDGE OF ISSUES RELATED TO LIFE CYCLE APPROACHES AND ACT IMMEDIATELY TO MAINTAIN ACCESS TO MARKETS IN FOREIGN JURISDICTIONS. Greater awareness and understanding of the benefits and implications of Life Cycle Approaches are crucial within the federal public service and in key departments. Senior government officials, especially those involved in trade discussions, need to recognize that standards and regulations imposed by other jurisdictions and based on Life Cycle Approaches may be detrimental to Canada’s economic competitiveness. This knowledge will enable Canada to be proactively involved in international discussions related to Life Cycle Approaches to ensure that the resulting policies and guidelines do not negatively impact Canadian interests. At these discussions, Canada should encourage the use of Life Cycle Approach methodologies that are based on sound science and reflect the Canadian context. Similarly, Canada needs to leap forward on identifying products and commodities most directly affected by Life Cycle Approaches. Knowledge and awareness will help determine where and how to target policy responses for sectors and firms within trade negotiations. This is not a job just for government. Bringing in key stakeholders, particularly business and industry associations, to leverage expertise and build appropriate life cycle applications is equally necessary. Put in place a system where robust Product Category Rules (PCRs) are developed by third parties with the oversight of the federal government (“certify the certifier” principle). THE GOC NEEDS TO HELP CANADIAN COMPANIES ACQUIRE THE KNOWLEDGE AND INFORMATION REQUIRED TO RESPOND TO THE DEMAND FOR LIFE CYCLE INFORMATION AND MAINTAIN MARKET ACCESS. Businesses are very much on the front line of this development. Industry sectors, such as retail, consumer, food, beverage, and resource extraction and processing increasingly need to be aware of current and anticipated market-access restrictions related to Life Cycle Approaches. Companies need to understand how Life Cycle Approaches work and have the technical and financial capacity to respond to them, across supply chains, for example in producing Environmental Product Declarations (EPDs). A Canadian Life Cycle Inventory (LCI) database is a key tool to provide sectors, firms, and governments with the data required to respond to these demands without having to replicate comprehensive and expensive analyses on their own. Small- and medium-sized enterprises (SMEs) in particular need assistance, as they often do not have the capacity to meet these requirements but need to be able to respond to these developments. Develop initiatives aimed at supporting SMEs who want to get involved in Life Cycle Approaches but lack the capacity and expertise. CANADA NEEDS TO PROACTIVELY ENGAGE AT MULTIPLE LEVELS ON ISSUES RELATED TO LIFE CYCLE APPROACHES. Canada’s participation in life cycle areas has been limited. Canada needs to keep pace with the global trend to avoid risks to international and firm-level competitiveness. Immediate action is needed to mitigate these risks. Internationally, the World Trade Organization, UNEP-SETAC (Life Cycle Initiative), International Organization for Standardization (ISO), the NAFTA Commission for Environmental Cooperation and European Commission are key entities with which Canada needs to discuss issues related to Life Cycle Approaches, especially with regard to trade and market access. Canada needs to address issues such as the harmonization of life cycle standards with the United States, our main trading partner. Domestically, the government needs to engage with the private sector, academia, and NGOs to share information on key life cycle issues of importance to the country and determine collaborative and practical ways to move forward. Proactively engage in multilateral and bilateral discussions with key trade partners, particularly the United States and the European Union. This will reduce the risks of having Canadian goods and commodities subject to standards established by foreign interests that are not consistent with our own. The aim is first to ensure Canadian economic interests are not penalized by foreign rules and regulations targeting or side-swiping our commodities and goods, and second to build a trading framework based on mutually-recognized life cycle science, data, and information. THE GOC NEEDS TO SHOW LEADERSHIP IN THE APPLICATION OF LIFE CYCLE APPROACHES TO ITS OWN INTERNAL OPERATIONS AND POLICY DECISION MAKING. Government officials need to be aware of the benefits of Life Cycle Approaches and the tools already available to them (e.g., Life Cycle Costing [LCC], Life Cycle Thinking [LCT], and Life Cycle Assessment [LCA]). Support from the highest level is needed – that is, from deputy ministers and central agencies. Government officials need to have access to advice and training from a recognized “centre of expertise” within or associated with government. The government’s expansive asset base of building and transportation fleets is a rich area for life cycle application to generate efficiencies and save money. In particular, better and more complete data is needed across all phases of an asset’s life cycle, especially during the use phase. Build knowledge and deliver training for government officials, including senior management and key officials in designated departments and central agencies, to move these initiatives forward with appropriate performance management incentives.